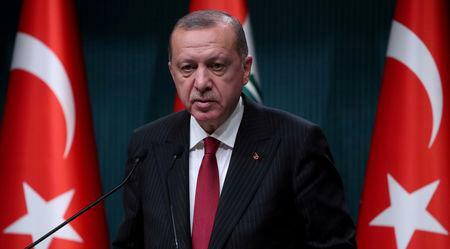 ISTANBUL (Reuters) - President Tayyip Erdogan said Turkey's calls for a ceasefire in Syria's rebel-held Idlib region were bearing fruit after days of relative calm but more work needed to be done, Hurriyet newspaper reported on Monday. Erdogan was due to hold talks in Russia later on Monday with President Vladimir Putin, whose military support for the Syrian government has helped reverse years of rebel gains and who publicly rebuffed Turkey's ceasefire call 10 days ago. "The situation in Idlib has been calm for three days. It looks like we obtained a result with the efforts which were made," the newspaper quoted Erdogan as telling reporters on a flight back from Azerbaijan at the weekend. "But we are still not satisfied," he said. Turkey, with 3.5 million Syrian refugees, has already borne the "political and human burden" of Syria's seven-year-old conflict and any new refugee flow would head for Turkey, Erdogan said. Turkey, which supports rebels opposed to Syrian President Bashar al-Assad, has been holding talks with his allies Russia and Iran over the fate of Idlib and surrounding districts which Assad has vowed to recapture. Ankara has established a dozen military observation posts around Idlib, which it has reinforced with troops and equipment in recent weeks according to Turkish and Syrian rebel sources. "We are trying to protect the pure, clean, innocent people there with these observation posts," Erdogan said. "But currently everybody can see the regime's mercilessness and the terror which they are spreading there. There is a terror state." The Idlib region is home to around 3 million people. Parts of it are held by Turkey-backed rebels but many of the towns are controlled by jihadist fighters such as Tahrir al-Sham, which includes insurgents from the former al Qaeda branch in Syria. Turkey has called for measures to target hardline militants in Idlib while protecting civilians and avoiding an indiscriminate assault, likely backed by Russian air power, which it says would cause a humanitarian catastrophe. "Let's all take steps, measures together against the terror groups among the opposition in Idlib," Erdogan said. "But let's not create an excuse and take a step like bombing there."